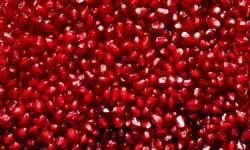 There are three varieties of pomegranates, sweet, semi-sweet and sour pomegranates. Regardless, however, the taste you prefer you should choose heavy pomegranates with a shiny and firm skin. Of course even when their skin shrinks , the interior can be easily consumed. 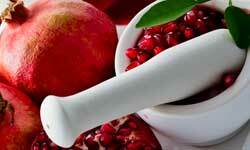 Cleaning the pomegranates requires a little time, but it is easy. Cut in circle and remove the skin of the stem, scratching up the bottom, without pressing the knife as much as you do with an orange . Then open the pomegranate in half and remove the seeds. Pomegranates can be kept for several days without refrigeration. It is recommendable to keep them in a dark place. If you want to keep them for several months, you can put them in the freezer. You can also clean them and store them in the freezer, sealed in a special container or food bag, so whenever you need the seeds you can use the amount you want. There are two ways to get the juice from the fruit: either by using the wringer , as you do with oranges, or press the fruit in a colander .With the colander the membranes are not separated from the seeds so you might get a slightly sour taste in the juice.